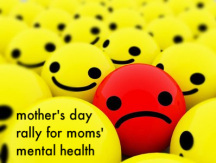 On Sunday, May 11th, we’ll be celebrating our 6th annual Mother’s Day Rally for Moms’ Mental Health here at Postpartum Progress. That day we’ll feature 24 letters to new moms, one posted each hour on the hour, from great writers who’ve been there. They know how it feels.